As a tried and true source of high quality grooming products since 1970, The Original Mane ‘n Tail is now taking breakthrough technology to next level providing you with the answers to all dirty, dull drab, coat, mane and tail issues. 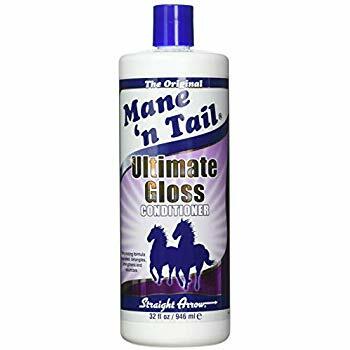 Our solution, Mane ‘n Tail Ultimate Gloss Shampoo and Conditioner System. The Ultimate Gloss Conditioner is the second step that provides the highest shine for your horse’s coat, mane and tail! It combines natural oils and proteins that deeply moisturize while building volume, strengthening and restoring elasticity to your horse’s mane and tail. It detangles in the process, facilitating an easier comb out. The result leaves the mane and tail with a soft, silky, luxurious look and feel with a brilliant, Ultimate Gloss finish. Now your horse doesn’t need an ‘knight in shining armor’ to get noticed, just the Ultimate Gloss! Deep Conditioning with natural oils and nourishing protein; helps restore elasticity and strength with scalp benefits for preventing flaking and scaling. Detangles and volumizes, leaving the mane and tail easy to comb out with fullness. pH balance for Everyday, can be uses as a Leavin-In or Rinse out treatment.